Early in March this year an international conference was held in Austria on the theme of ‘The Child in the City’. It was organised as part of the Salzburg Global Seminar series of policy exchanges, and as one of the participants it was especially gratifying to hear two young women landscape architects – one working in Mexico City, the other in Beirut – say how much they had been inspired by their visits to the Dalston Eastern Curve Garden. It was for them, they said, an international exemplar for the re-habilitation of derelict urban land awaiting development. 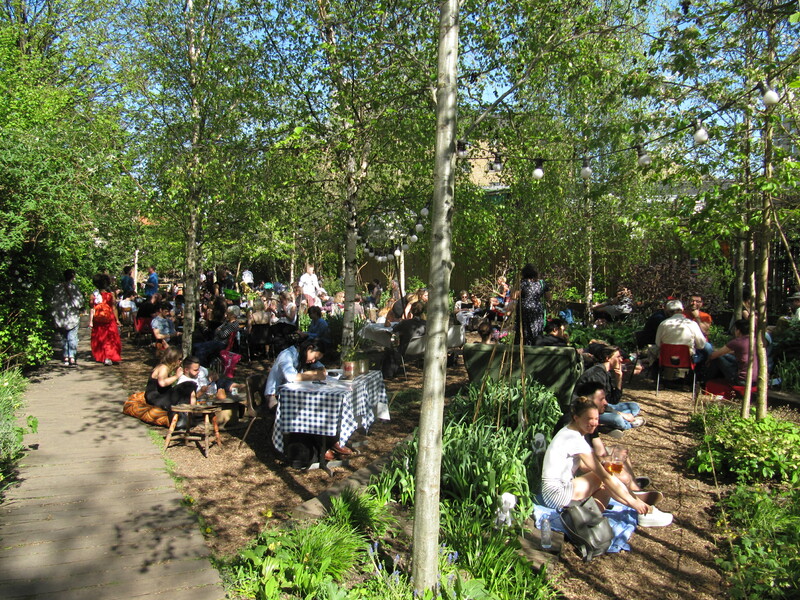 A crowded and enthusiastic party of supporters was held at ‘the Curve’ on Sunday, 9 April, organised to draw attention to the plight of the garden, now threatened by development. People came to show their affection for this unique public space, and to urge that it be protected against future development – whatever its temporary status might have been once – given its phenomenal success. In a short time the Dalston Eastern Curve has become one of Hackney’s best-loved meeting places, which may not have been predicted, but is now an established fact. And when the facts change, as John Maynard Keynes once wisely said, opinions (and decisions) should change too. Speakers included landscape architect Jo Gibbons and architect Liza Fior, whose separate practices came together to instigate the project through the process of engagement with the community, alongside French architects, EXYZT (whose own involvement resulted from the Barbican’s ‘Radical Nature’ exhibition in 2009). It grew out of a Design for London initiative called ‘Making Space in Dalston’. Both said the popularity of the garden and its ecological impact had grown with the imaginative way it was managed for people as well as for plants, while dozens of admirers ranging in age from 8 to 80 queued up to testify how much pleasure the garden had given. Two themes recurred in what people said was most important to them. Firstly that the garden had succeeded because of the dedication and love its workers and hundreds of volunteers had put in over the years – and you don’t often see the word love in many ‘regeneration’ mission statements. Secondly, that what made Hackney such a special place was that it was precisely a place where people did such things – especially around Dalston Junction (think Four Aces Club, think Centerprise, think Free Form, think Arcola theatre, think Café Oto, think Ray Walker’s great Peace Mural). Without these radical, eccentric, people-based projects, which attract interest from all over the world, the junction would be just another angry traffic jam churning out particulates into the lungs of all the passers-by. The borough has always been a social laboratory, and that’s what makes many people want to live in Hackney, rather than the enticement of expensive apartments and opportunities for fine dining. 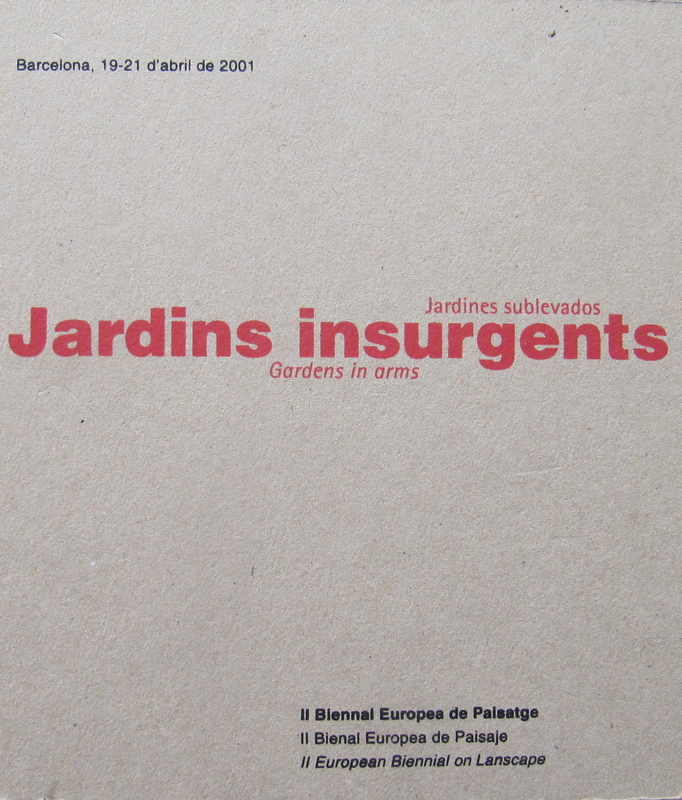 So if Hackney finds an internationally-admired exemplar of urban renewal on its doorstep, of the kind hoped for by the 2001 Barcelona conference on Jardins Insurgents, giving people in places like Mexico City and Beirut something to aim for, it would be a betrayal to allow speculative development once again to triumph over proven community need. There are so few success stories in sustainable urban renewal, to have one that grows in reputation by the day is why so many people are now resisting it being bulldozed to the ground – especially to make way for yet another retail corridor of uncertain provenance or future. Whatever happens in future, do visit the garden to see what an amazing place it is, and support the campaign to save it (and as a result save Hackney from becoming just another high-end residential quarter at the same time). The future is a garden, not a discount store.